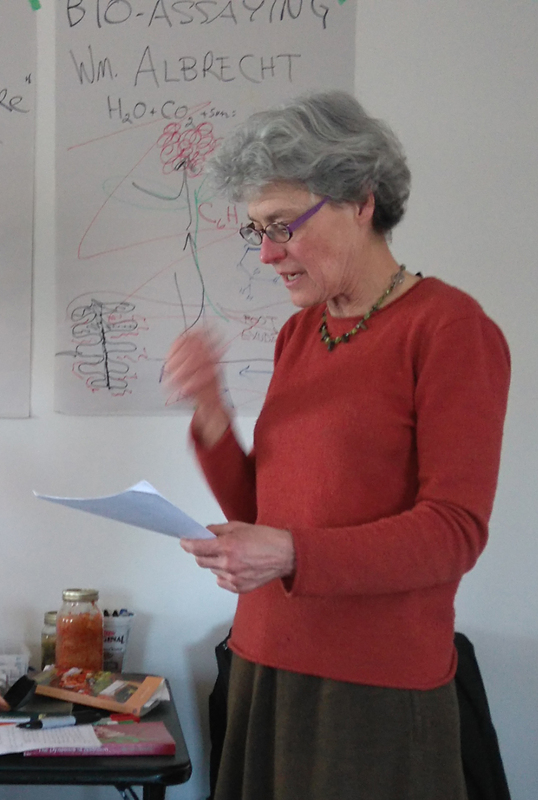 On Sunday, March 19, Titia Posthuma, a dedicated biodynamic farmer and teacher in Eastern Ontario, shared her insights and understanding on the connections between nutrition and agriculture at the Earth Haven Learning Centre in Thomasburg, Ontario. Ms Posthuma looked at this subject from several perspectives including human, animal, plant and soil nutrition. In my opinion, one of the most interesting references made during the workshop was the TED Talk by Rob Knight called “How our microbes make us who we are.” During his talk, Knight emphasizes that microbes in and on human beings affect behaviour, health and well being. I was reminded about how similar the beneficial relationship between humans and microbes is to how plants rely on microbes in the soil for nutrients. In fact this plant/microbe relationship is also mutually beneficial. The plant produces sugars made through photosynthesis in the leaves; these sugars are transported down the stem and into the fine root hairs where the microbes can access them. In exchange, these microbes provide nitrogen-rich organic nutrients which the plant needs for building proteins and other substances. And again I heard that the nitrogen supplied by fertilizers does not have the same biological qualities as nitrogen supplied by these microbes. Another point I noted in the workshop was the observation that animals such as cows have a cognitive ability to be selective in what they choose to eat. For example, cows can select higher quality grain over lower quality grain. Humans need to be more discerning in their choice of foods. Ms. Posthuma shared that Rudolf Steiner, who introduced the basic philosophical and practical methods for biodynamic agriculture in the 1920s, claimed that complete digestion includes the full breakdown of ingested foods and the full rebuilding of essential nutrients. This digestive process in humans is somewhat similar to the annual decomposing and rebuilding processes that go on in topsoil. In summer and fall, the leaves start to decompose and form a nutrient and microbial rich layer called humus. Plants with deeper roots, such as trees, bring minerals up from the subsoil and over time these minerals make their way into the stable humus layer and are passed on into the microbes and surrounding plants, and ultimately into animals and humans. The workshop closed with this emphasis on building stable humus with lots of organic matter. This stable humus is a way of building microbial housing so to speak and must include a balance of both bacteria and fungi. One of the key messages I took away from this talk was that as farmers and gardeners we need to is grow more soil. The quality and health of our soils and its microbes is directly linked to our own health and well being.